As the name suggests, the Pulser module is designed to pulse the output. Whenever something needs to be turned on and off on a regular basis, the Pulser can probably do it. And that’s whether it’s pulsing a horn as an alarm, switching on an intercooler water spray for 5 seconds every minute, or flashing a warning light. You can even automatically flash your headlights – perfect for alarm or show uses. The Pulser is based on the eLabtronics Multi-Purpose Module (see The eLabtronics Performance Modules). 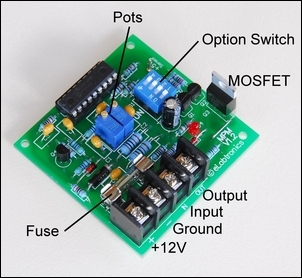 It has a high current output transistor called a MOSFET, a fuse, four wiring connections, an option switch (not used in Pulser configuration) and two user-adjustable multi-turn pots. Let’s look at the functions of the pots first. 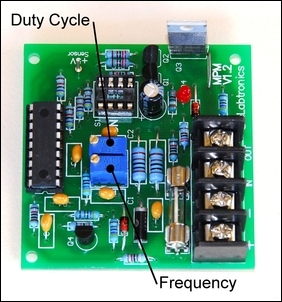 As can be seen in this picture, one pot controls frequency and the other pot, duty cycle. So what do these terms mean, and how do you use the pots to achieve the effect you want? If you think of anything that pulses on and off, there are two different factors that can be varied. The first is frequency – how many times per second it turns on. 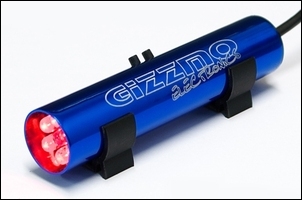 For example, a flashing LED shiftlight might flash 3 times a second – that’s pretty fast. On the other hand, once triggered, an intercooler water spray might turn on once every 15 seconds – that’s clearly much slower. By turning the frequency pot, the pulsing rate can be varied from 10 times a second right through to once per hour. That’s a huge range. Turning the pot clockwise increases the frequency (ie makes the output pulse faster). Note that the action of this pot is non-linear, allowing the accurate setting of the frequency from very fast to very slow. The other aspect that can be varied is duty cycle. 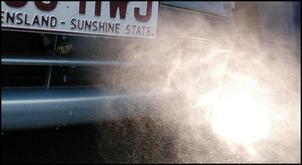 Think about that intercooler water spray that we described above as coming on once every 15 seconds. If it sprayed for half the time (ie 7.5 seconds) it would be said to have a 50 per cent duty cycle. If it sprayed for three-quarters of the available time (ie 11.3 seconds) it would be said to have a 75 per cent duty cycle. Now the reason that you’d pulse an intercooler water spray is to save water (ie give time for the sprayed water to evaporate) and so a reasonable duty cycle to use might be 5 seconds every 15 seconds – that’s 33 per cent. By turning the duty cycle pot, duty cycle can be adjusted from 0 per cent (ie the output is never on) right through to 100 per cent (ie output always on). Normally, of course, you wouldn’t have this pot set to either extreme. Turning the pot clockwise decreases the duty cycle (ie makes the output pulse a smaller percentage). One of the huge advantages of the eLabtronics Pulser is that frequency and duty cycle can be independently varied at will. For example, if you want to flash a high power LED (say as a hazard flasher or even as an in-cabin ‘alarm on’ indicator) you’ll want to use as little battery power as possible. By setting the duty cycle very short (eg 20 per cent) and running at a high frequency (eg 3 or 4 times a second) you can create an attention-getting indicator that uses about 80 per cent less power than if the LED was on all the time. That’ll save your battery from going flat! 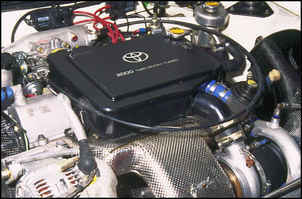 Or perhaps you have a car with a water/air intercooling system. By setting the Pulser to switch on the pump for 15 seconds every minute, you can keep the water circulating (and so the intercooler heat exchanger cool) without wearing out the pump. Note that in most applications there won’t be any ‘right’ frequency and duty cycle – you simply adjust the pots to alter the output to achieve what you want for the application. You don’t even need to know what the resulting frequency and duty cycle actually are – just adjust the pots until the system is working correctly. The output MOSFET (transistor) is rated to handle a continuous 10 amps – but that’s when it is fitted with a big heatsink. 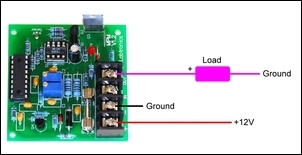 How hot the MOSFET (and the circuit board) get depends not only on the output current but also the duty cycle. If the current is high but the duty cycle is short (eg 20 per cent) then the MOSFET will be able to cool down between each pulse. But if the duty cycle and current are both high, the device will get hot and need plenty of heatsinking. As a rule of thumb, no heatsink at all will be needed if you’re operating warning lights, LED shift lights or beepers. If you are pulsing a string of low power filament lamps, a small heatsink will be needed. 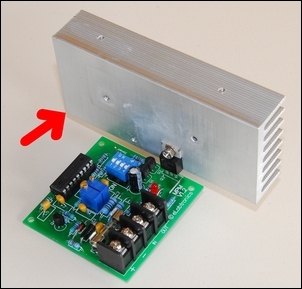 If you’re pulsing a pump, a medium sized heatsink will usually be needed. Finally, if you’re pulsing multiple car horns or multiple headlights, a large heatsink will be needed. Remember, in each case, the longer the ‘on’ time of the pulse, the greater the need for a heatsink. 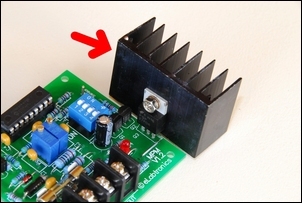 Don’t forget that in most uses of the Pulser, no heatsink – or only a small heatsink – will be needed. When using an external sold state relay, the Pulser MOSFET doesn’t need to use a heatsink, so packaging becomes easier – the Pulser can easily fit into a box and the solid state relay can be mounted remotely. This diagram shows how the relay is wired to the Pulser module. 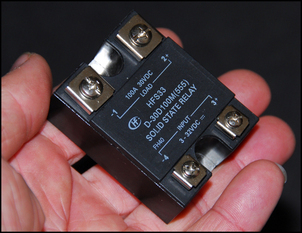 The electronic relay is available from the AutoSpeed shop for AUD$40 – see Solid State Relay. Ground – marked as ‘-‘. You’d normally connect this to chassis earth or the negative terminal of the battery. 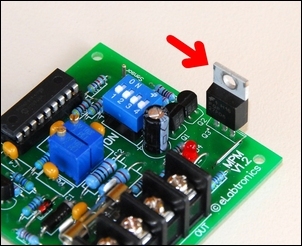 To switch the Pulser on, the input wire needs to be connected to 12V. 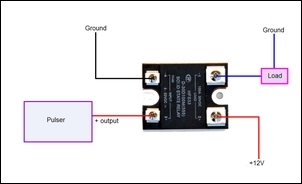 Therefore, at its simplest, you just connect the input wire to the power supply – putting a switch in that wire to turn the Pulser on and off. The input wire takes only a tiny current, so even if you have the Pulser operating something that’s pretty current-hungry (like a horn or pump), the input wire switch can be rated for nearly no current. 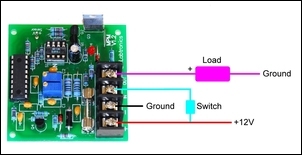 This function is really good because it means the Pulser acts like a high power electronic relay – you can switch the input using a low current micro-switch, pressure switch, etc. In fact, the input wire of the Pulser turns on when it receives a voltage above about 2.6 volts. 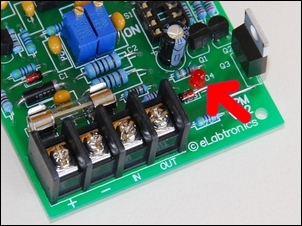 Therefore, it’s possible to use a sensor to switch on the Pulser when a signal rises above this voltage. We’ll have more on this in Part 2 of this series. Frequency pot set half a turn anticlockwise from the fully clockwise position. (Note: These pots are multi-turn so don’t expect to make only one rotation when setting them. Multi-turn pots also don’t have clear end-stops [although they can sometimes be heard clicking when they’ve reached the end of their adjustment] ). Duty cycle pot set to roughly the middle position. If nothing happens, check your wiring and then the module’s fuse. Make sure that you don’t have the frequency pot set too fast or the duty cycle pot set to either extreme end of its travel (ie 0 per cent or 100 per cent). If all is working correctly, adjust the frequency and duty cycle pots (in that order) to gain the results you’re after. With the settings finalised, make sure that the output MOSFET (or heatsink, if fitted) isn’t getting too hot – it’s OK if it grows very warm but it shouldn’t be too hot to touch. 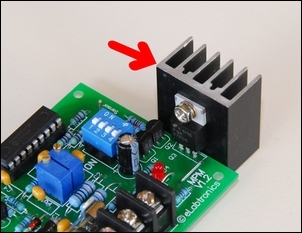 If it is hot, increase the size of the heatsink or add an external solid state relay (see 'Ultra High Currents' breakout box above). If no heatsink (or only a small one) is fitted, the module will fit into this box. The Pulser achieves a very simple aim – switching things on and off. The beauty of the design is in its compactness, power handling ability and the ease with which a wide range of pulsing behaviour can be attained. If in a car you need to switch anything on and off with a regular repeating pattern, the Pulser will be hard to beat. The Pulser is available fully built and tested from the AutoSpeed Shop - see eLabtronics Pulser (Pre-Built Kit) .